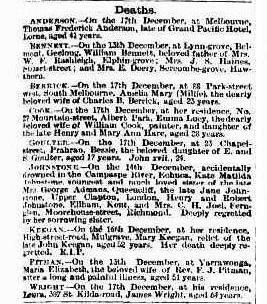 Mary Jones, was a convict from Middlesex, London, who arrived in Sydney aboard the Broxbournebury on 28 July 1814. 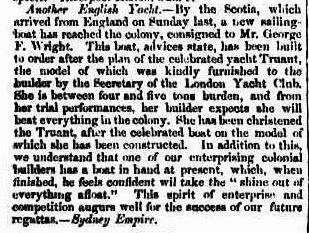 George Wright, also from London, arrived on the convict ship Somersetshire on 16 October, 1814. They are the 4 x Great Grandparents of my husband Geoff Rundle. Mary and George had one daughter, Mary Fautley Wright 1815-1888, and four sons, George R. Faulty Wright 1817-1879, William F. Wright 1818-1872, Thomas Wright 1824-1885 and James Faughtley Wright 1826-1889. This record for Mary Jones gives wonderful information about her conviction at the Old Bailey, London in September 1812. This helped me identify her crime which is dealt with later in this chapter. 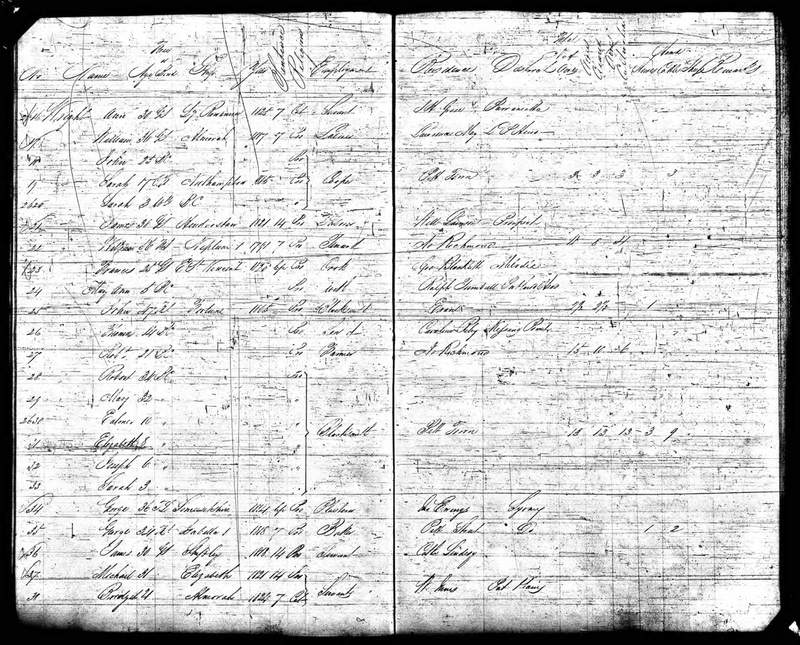 There is another Mary Jones listed on this page, keen readers will see how important it becomes to identify Mary and her ship and the date of her arrival at Sydney Cove, just a few months before the arrival of George Wright on the Somersetshire in 1814. I can’t help wondering what happened to Mary Jones in those intervening years before her transportation to Australia. Perhaps she was kept on a hulk in the Thames? 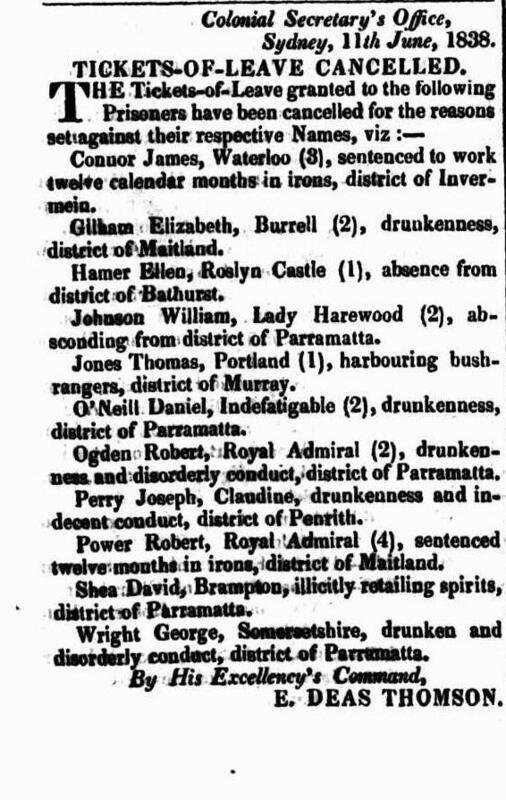 A perplexing, though not surprising fact was how many Mary Jones and George Wrights had been transported as convicts to the Colony of New South Wales before 1820. My goal was to corroborate Mary and George’s correct ships and their dates of arrival, and this became my objective and challenge. In this quest, I owe a huge debt of gratitude to the English transportation system for recording the General Musters each year. This very English love for detailed law and order is admirable and in their effort to keep an eye on their convict numbers, they created a forensic way to trace convict ancestors for decades in the early Colony. The inclusion of the ships on which the convicts were transported is the key to unlocking the past. 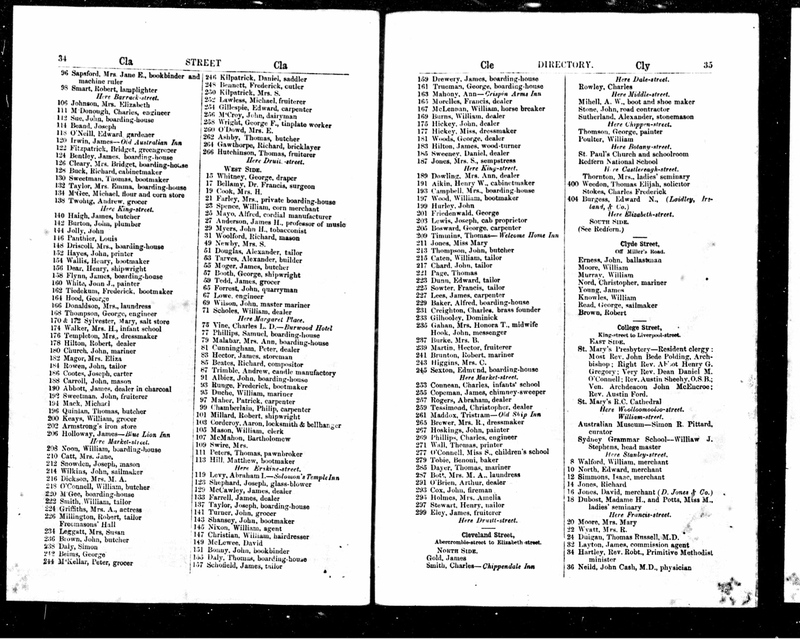 The notated listing on the Musters and Census’ margins of spouses and children of convicts born in the colony (BC), their addresses and employment details is such a bonus. George F. Wright is buried at Camperdown Cemetery with his daughter Mary Ann Brown, and her husband William Brown in the Brown Family Vault, just metres from St Stephens Church, on the main driveway loop of the cemetery. 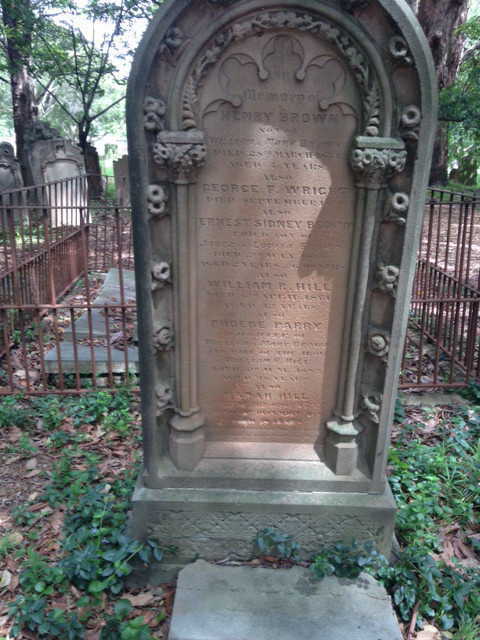 In the grave are three of George F. Wright’s grand-children, Henry Brown, died 28 Mar 1854 aged 5, Emma Elizabeth Brown, died 12 May 1885 aged 34, and George Richard Sydney Brown, died 18 Dec 1902 aged 47. They were three of William and Mary Brown’s children, from their large family of fourteen. 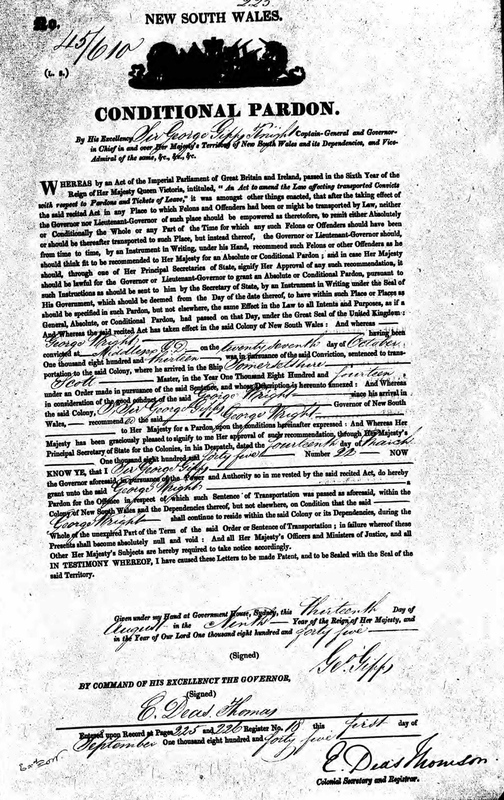 My aim is to prove that the mother of George F. Wright’s children is Mary Jones, and present documentary evidence towards this objective, as well as to establish that Mary Whitfield, foster parent of the Wright’s three youngest sons, William, Thomas and James Wright, with her husband Thomas Whitfield, were long-time friends of George F Wright and his common-law wife Mary Jones. 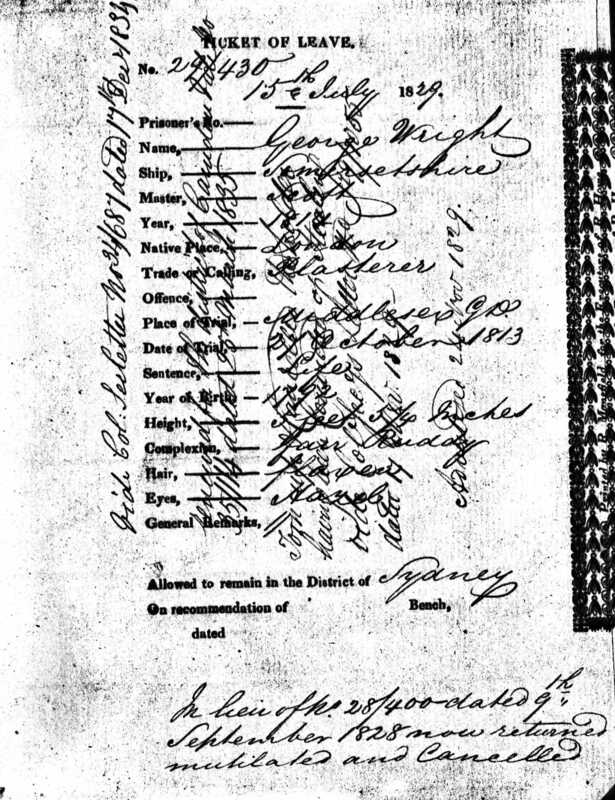 My difficulty in searching for Mary Jones has been compounded by incorrect Ancestry.com family trees and the acceptance, without proof, that Mary Whitfield, who is listed on George F Wright’s death certificate as his wife of 28 years, was also the mother of his children Mary Ann Faughtley as well her brothers George R. Faulty (sic), William F. Wright, Thomas Wright and James Fauntley (sic) Wright. On the grave at Camperdown Cemetery, Mary Ann Brown nee Faughtley has her birth date of 12 Sep 1815 written on the right front shield. To make matters even more confusing some family researchers have listed a Mary Tarlitan as the wife of George F. Wright. 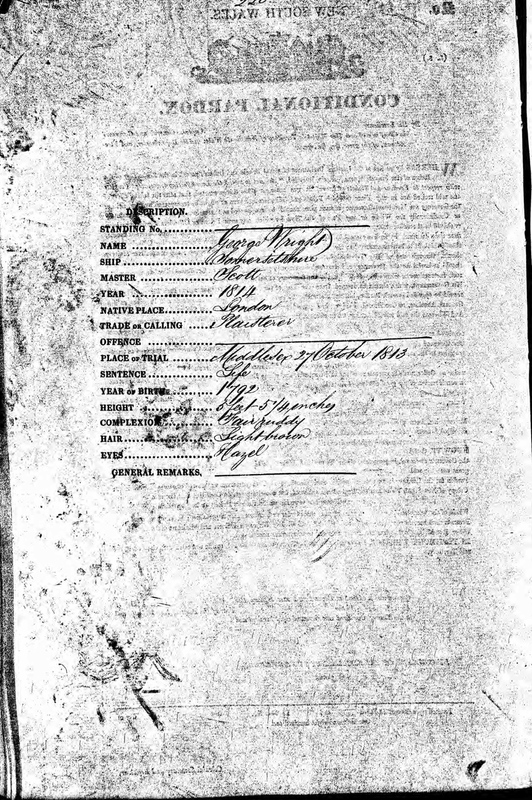 Mary Tarlitan married another George Wright and the date 1815 was convenient to tie in Mary Brown, however this connection is incorrect, when censuses and locations are compared. Recently I did some research into Mary Whitfield. I found a Colony of NSW census for 1828 which lists Mary Whitfield living with her husband Thomas Whitfield, both aged 31 years, and three foster sons with the surname Wright, all listed as living at Parramatta. The three Wright boys were listed in this order: James Wright (2), William Wright (6) and Thomas Wright (4). Thomas Whitfield is listed as head of house, a Protestant blacksmith and the husband of Mary Whitfield. The three foster children living in the house, have names and ages correctly relating to the children fathered by George F Wright, who was transported in 1814 on board the Somersetshire, convicted of stealing a silver covered dish and a table cloth. 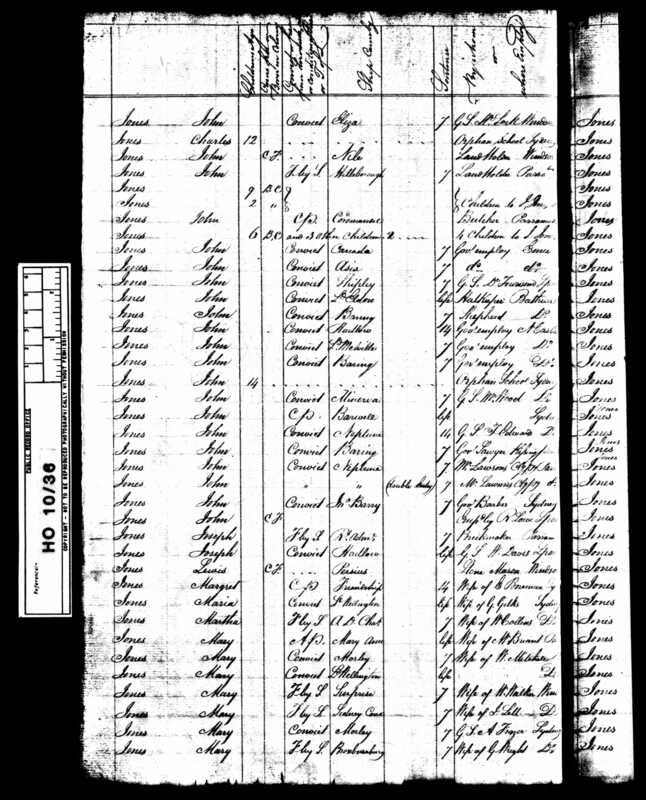 One valuable piece of information from this census record is that Mary Whitfield is listed as arriving in the colony as a convict aboard the Northampton, and her husband Thomas Whitfield as a convict aboard the Indefatigable. The Wright children are all listed as BC meaning, born in the Colony of New South Wales. A search of the ship’s list for the Northampton revealed the name Mary Mascall and this name was helpful in finding not only details about Mary Whitfield nee Mascall’s convict details, but also her marriage record to Thomas Whitfield. 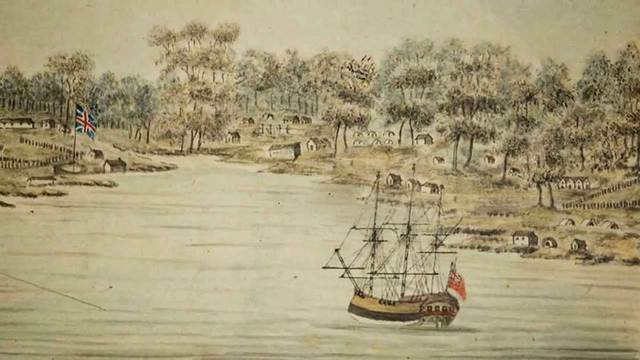 The Northampton arrived in the colony of New South Wales on 18 June 1815. If Mary Ann Faughtley, who was born 12 September 1815 were to be the child of Mary Whitfield, and born 12 September 1815, then clearly George F Wright is not her father, as George arrived in the colony aboard the Somersetshire in 16 Oct 1814 almost a year earlier. 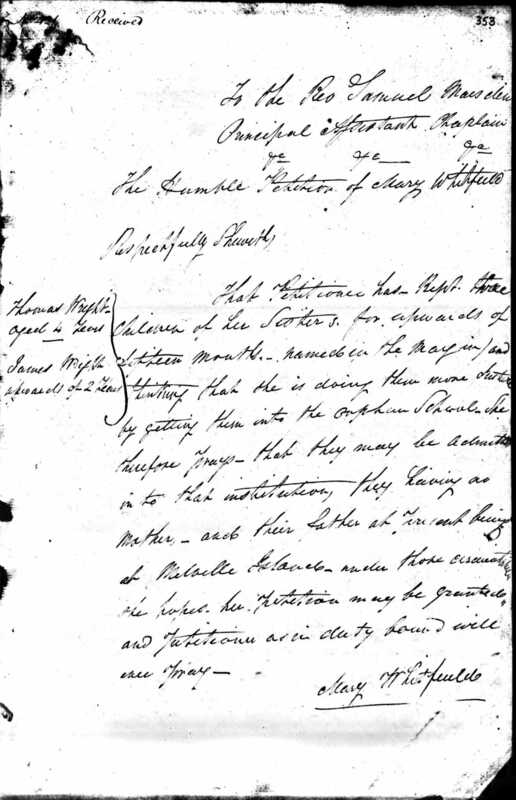 This new information clearly eliminates Mary Whitfield as the mother of Mary Ann Faughtley and places Mary Whitfield properly in the position as foster mother of Mary Faughtley’s three youngest brothers, and as a probable friend to George Wright. However, on this information alone, Mary Whitfield could still be the mother to the four sons of George Faughtley Wright. This now seems unlikely, due to her marriage to Thomas Whitfield. 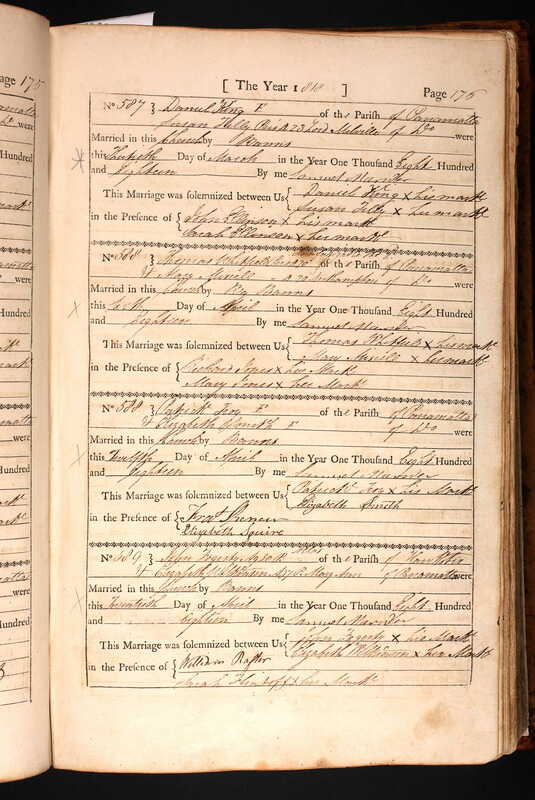 Thomas Whitfield and Mary Miscell married in Parramatta on 9 April, 1818 and it was so interesting to see on this record that the two witnesses were Richard Jones and Mary Jones. None of the bridal party could write and thus beside their names are the crosses to indicate this. In this case the name Miscell is spelt phonically, as Mary was illiterate. Mary Whitfield had two other valuable original records. 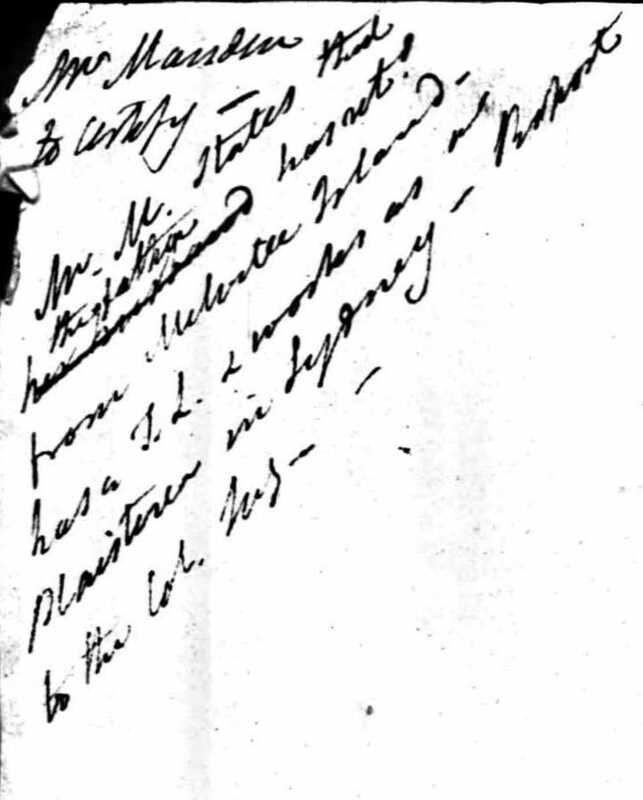 In 1828, as petitioner, appealing to the Magistrate presiding over Admissions to Orphans School, so that Thomas and James Wright might be admitted, on account of the fact that their mother was dead, and that their father, a convict, had been sent to Melville Island. The original record includes a handwritten plea to the magistrate from Mary Whitfield. 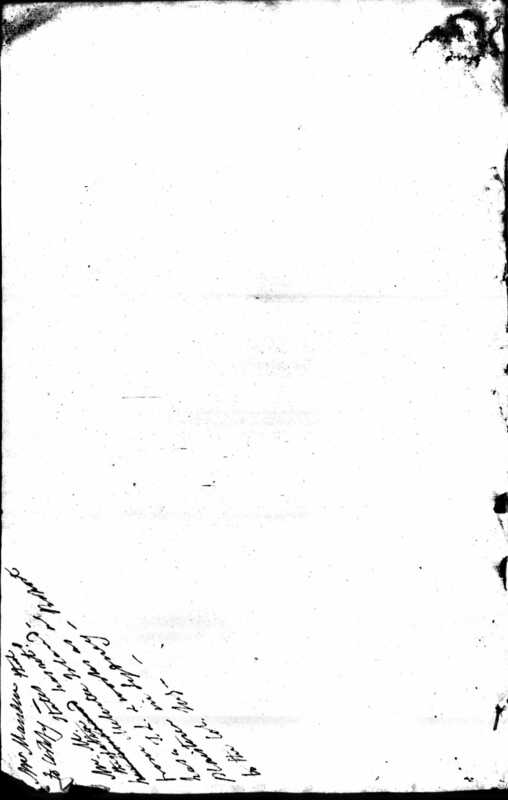 The reverse of the document is an upside-down note, in the bottom left hand corner, presumably written by the Magistrate, or his office, suspecting that George Wright is actually working at present in Sydney as a plasterer. As I downloaded this original record and clearly remember that I nearly missed this precious piece of information on the second page. Two interesting pieces of information about this application is that it was addressed to the Rev. Samuel Marsden, who had a reputation as a stern and unforgiving man in the early Colony of New South Wales. 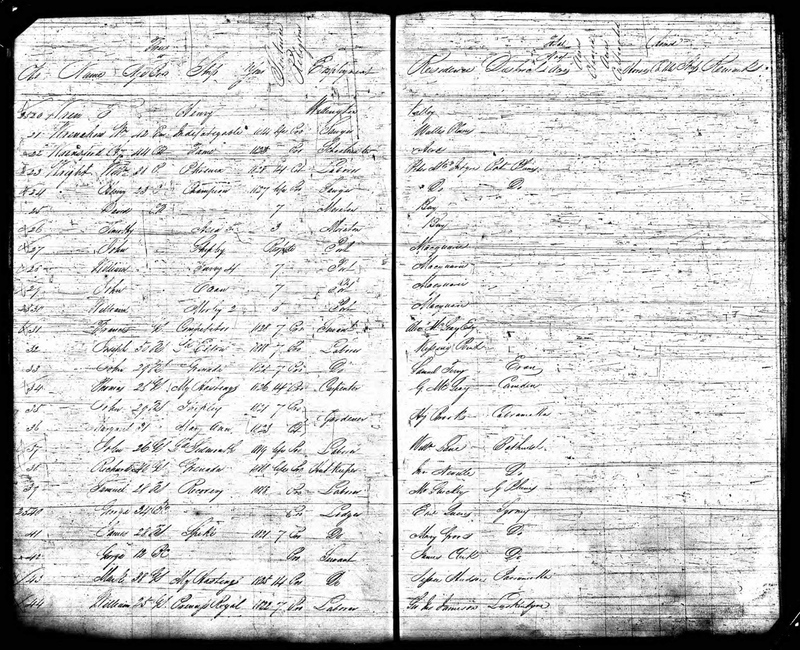 Gleaned from the State Archives was the fact that the Male Orphan School was moved from George Street, Sydney to Cabramatta in 1823.
Who then is the mother of the children, if it is not Mary Whitfield? 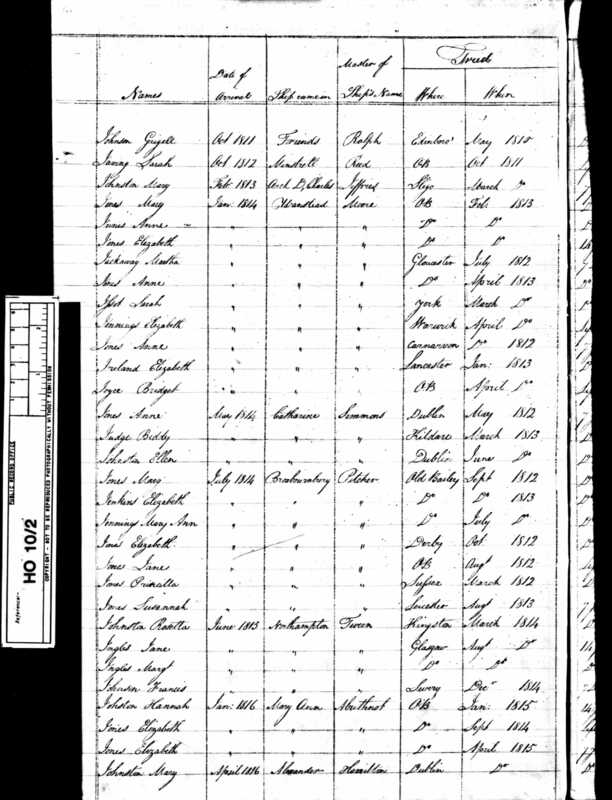 I decided to search for Census’ for George Faughtley Wright and his elder son George and daughter Mary. 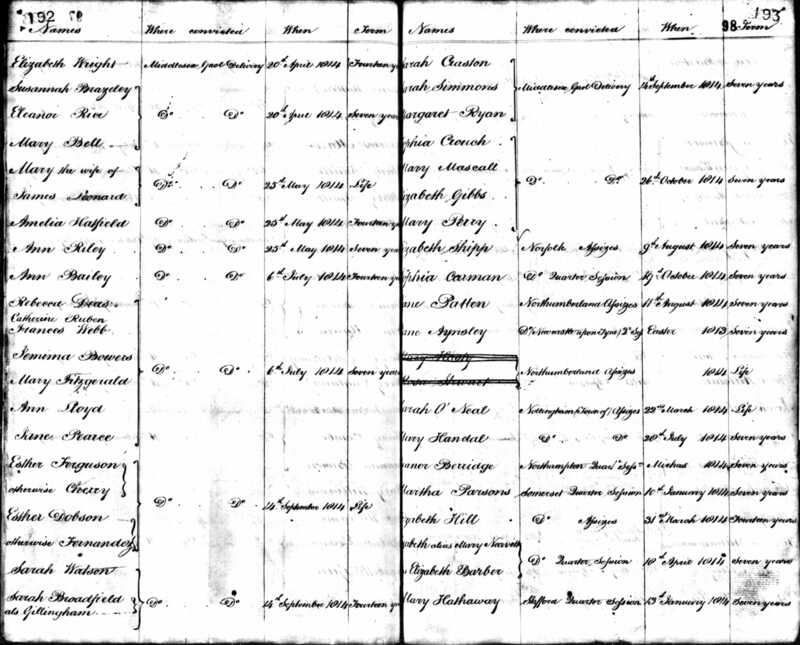 I immediately came across a Census for George Wright for 1828, listed as a plasterer working for a Mr Ewings of Sydney, clearly George Wright never went to Melville Island! I then found another census for George Wright from the Somersetshire, dated 1822-1824 and listed in the margin is a note saying he was the husband of Mary Jones of Sydney, listed beneath him is his son, George (5). 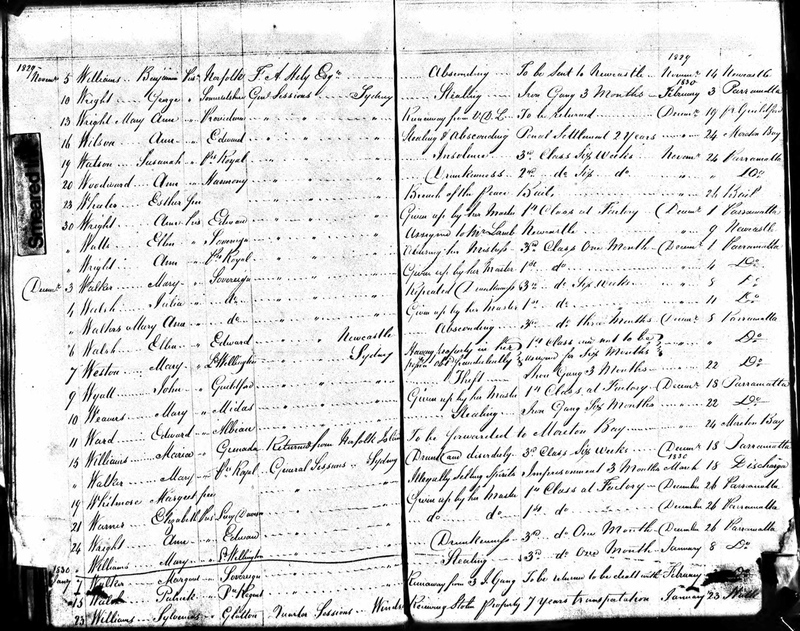 As I looked more carefully at the record I could see just a few listings further down the page, and there were two more sons, William Wright (3) and Thomas Wright (5mos). 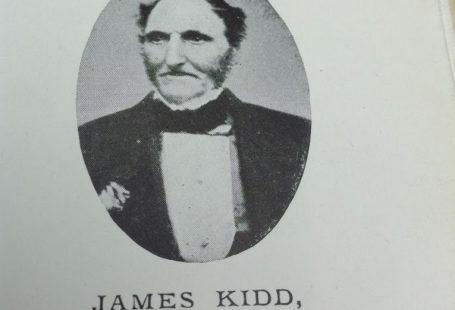 However, there is no listing for his daughter Mary and of course James isn’t born until 1826. 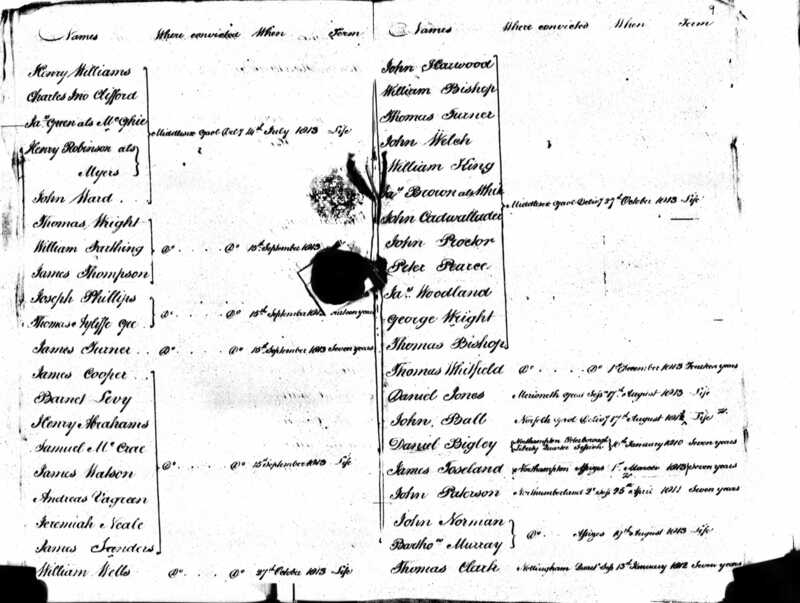 The next record I found was a Census document from Parramatta, also dated 1822, this record now lists the Wright family all together, George is listed as a convict from the Somersetshire, T.L. (ticket of leave) and includes Mary Jones, F.S. (freed by servitude) listing the ship she arrived on as the Bloxby. Below George and Mary were their sons, George 5, William 3 and Thomas 3 mos. 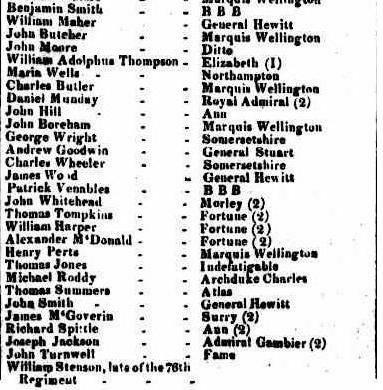 The record also listed the Captains of the ships and from this I was able to find out that Mary’s ship was in fact the Broxbournebury, which arrived in January 1814. 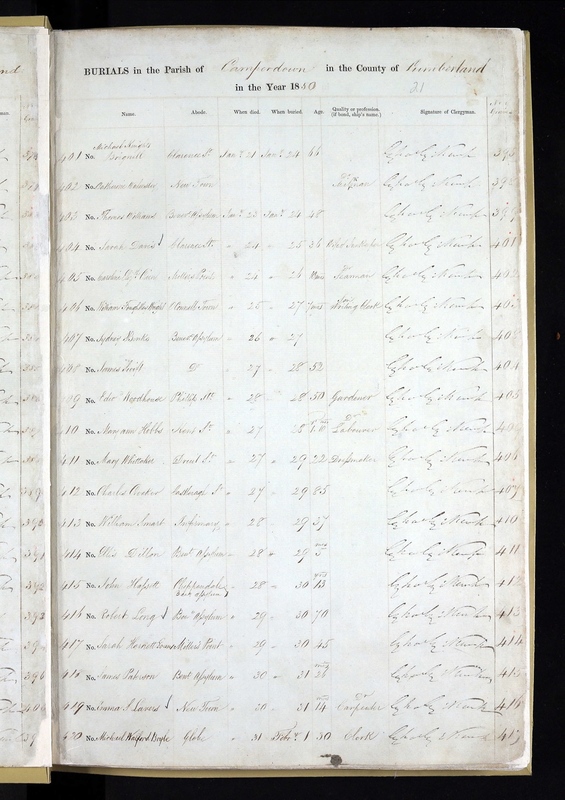 A list of convicts from the ship revealed a Mary Jones on board, convicted at London Assizes. 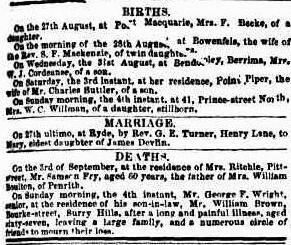 This means that Mary Jones, due to the date of her arrival in the Colony of New South Wales, is most likely to be the mother of all of George F Wright’s five children, including Mary Ann Brown nee Faughtley who was born in 1815. I have not found a birth record for Mary Ann Faughtley, nor a listing for her in a census from 1822, as yet. 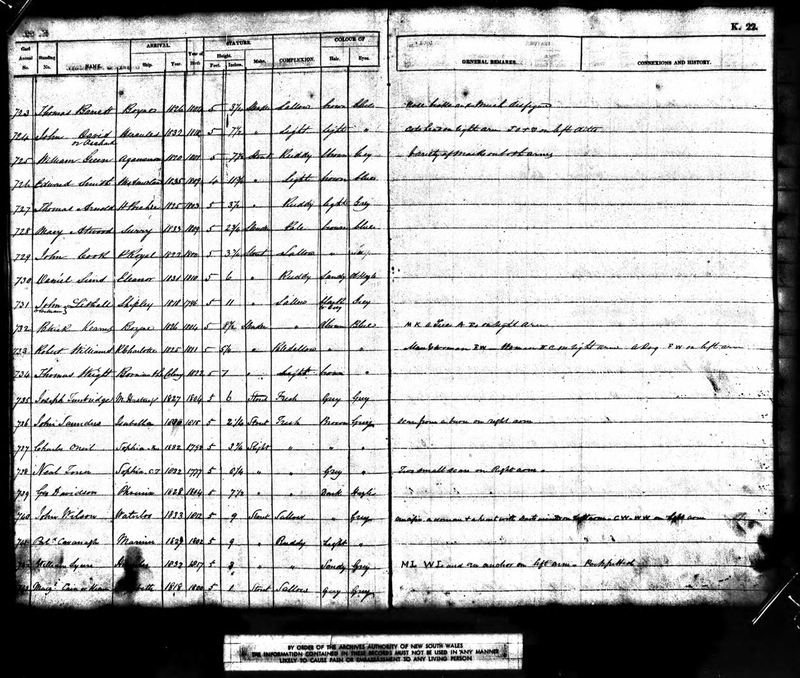 I searched for birth records for the children of George Wright and Mary Jones and I found just one which listed their eldest son George R Faulty. For the first time, I could see George Wright had begun to use an alias and over time I was to pick up the name spelt variously as Faughltey/Faulty/Fautley/Fauntley/Fortley. 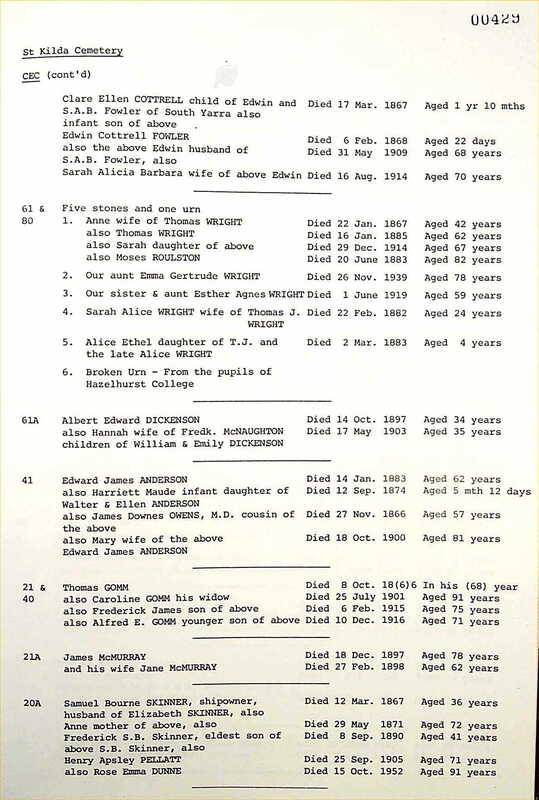 I also searched for the death records of all five of George and Mary’s children to see if any of them revealed their mother’s surname. 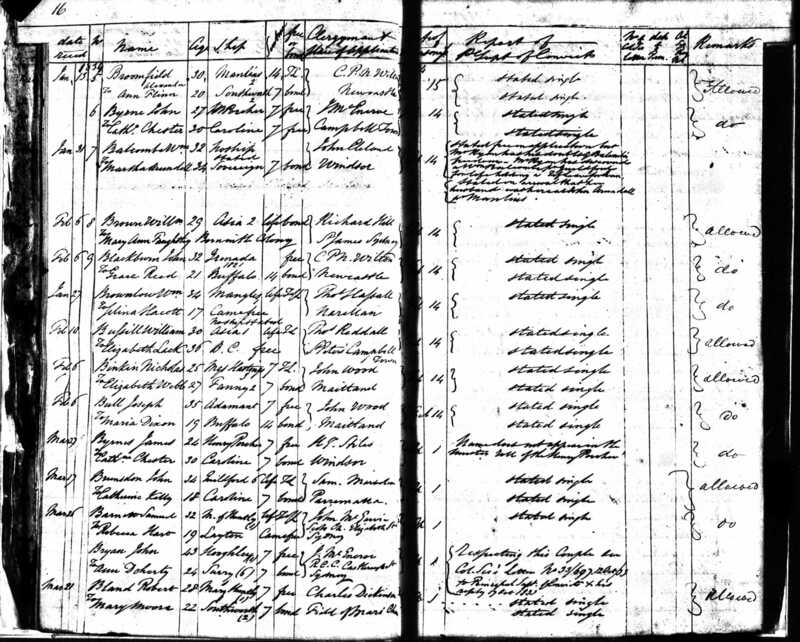 I decided to search again for Mary Wright in the Census records and found this listing in the 1828 Census. 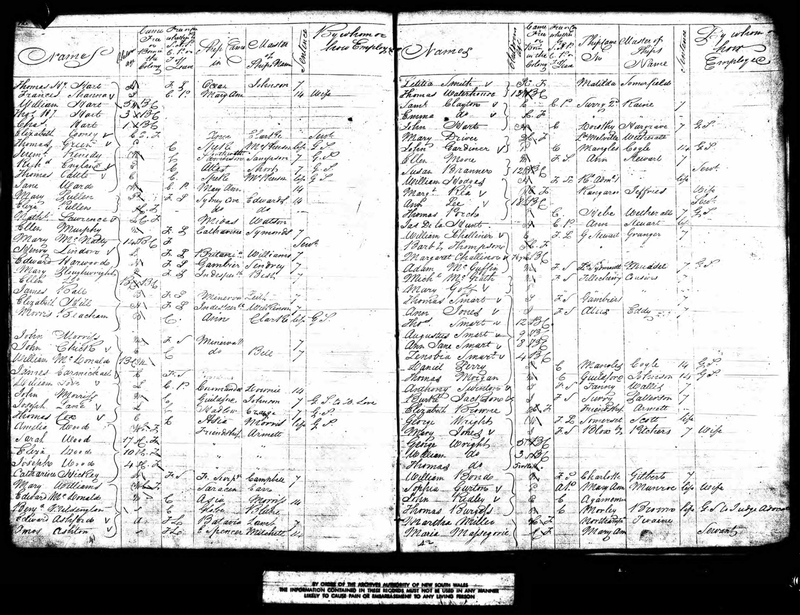 Mary Ann is listed in the same Census book as her father George Wright was listed. The fact that they were not listed together, but two pages apart amongst other Wrights in the colony is not really surprising. 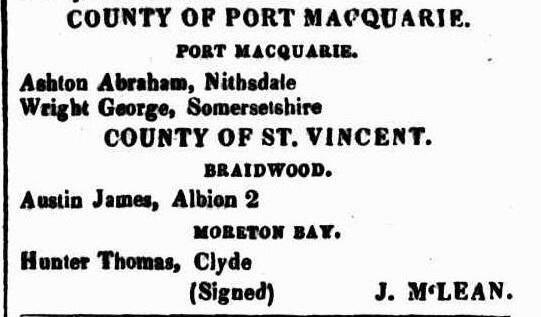 Mary Ann was a servant working for Thomas McMahon and most interestingly this is the first document I have found listing Australia instead of New South Wales. The name Faughtley as an alias for George Wright was an unusual name to pick, and one which he then passed onto some of his children. 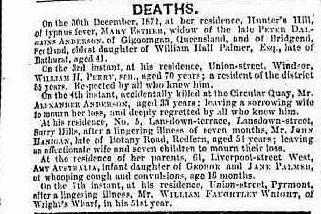 It was probably not possible for him to keep recording the births of his children under this alias when records were being tightened up in the Colony of New South Wales, so presumably George adopted the middle name ‘F’ for Faughtley to ‘uncomplicate’ things in his life. There is no record of a marriage between Mary Jones and George Wright, as there was probably no application for a convict marriage ever made whilst they were both still serving their convict terms. Therefore their ‘marriage’ is what was termed a common-law marriage in the Colony of New South Wales, convenient for those who found it too difficult gain permission to marry. It is interesting that Mary Ann, George, Thomas, James Wright all used the name Faughtley/Fautley as their surname when they married, while William listed his middle name as “F”. James kept the surname Fautley and passed it on as a surname to his children. Interestingly, there are other Wright family headstones on the back wall of Camperdown Cemetery, one listing the name Faughtley on it. It turns out that this is the headstone is for William Faughtley, the beloved son of Thomas and Ann Wright, who departed this life 25 January 1850, aged seven months. Thomas Wright is the son of George F Wright and Mary Jones, and shortly after the death of baby William Faughtley Wright, Thomas and Ann, together with their daughter Mary Ann, born in 1845, left Sydney and settled in Prahran, Melbourne, where another son William Joseph Wright was born in 1853. This headstone is amongst four other Wright headstones and it can’t be discounted that the people recorded here are possibly related, and there need to be more investigated to see if there is some relationship, especially if it could lead to the correct family of George’s back in England. It may well be that the headstones were simply grouped together on the back wall because they all had the familiar name Wright. I searched for a death record for Mary Jones and found this record from 1827 for Mary Wright, which I have accepted as correct. This date then ties in with Thomas and Mary Whitfield who were fostering the three youngest sons of George F Wright in 1828, after his wife Mary Jones had presumably died, namely William, Thomas and James. Obviously, it was a struggle for both George F Wright, and then for his friend Mary Whitfield to care for the young boys. Thus, the two youngest were put up for Orphan’s School. 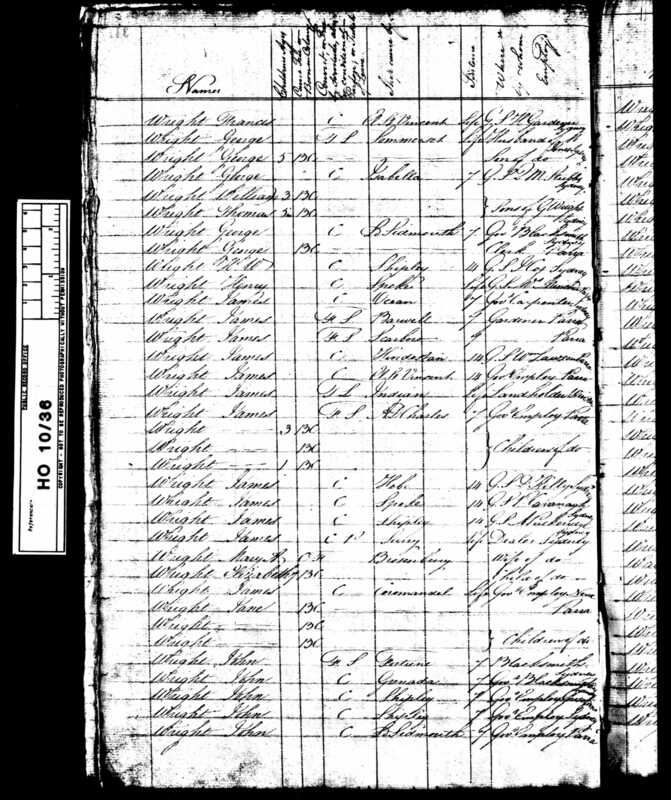 My next search was then to trace the elder children of George F. Wright – Mary Brown nee Faughtley and George R Faughtley, for inclusion in the 1828 census. 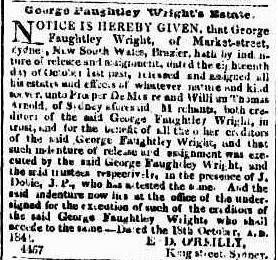 I searched first in the name of Faughtley but had no luck, however, I found two records for a Mary Wright and a George Wright, with ages that fitted the two children, and I found them both working as servants in Sydney. Mary working for a Mr McMahon and George working for James Clark of Sydney. I am happy to accept these two records as the eldest children of George F Wright as it would be expected that, due to their new circumstances without their mother, they would be found servant positions to assist their father’s grim plight. 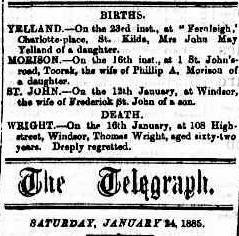 This search for information about the identity of the mother of George F. Wright’s five children I hope has now determined that Mary Whitfield is not their mother, with finding of another Mary – Mary Jones, who was the mother of the Faughtley/Faulty/Wright children, and who tragically died in 1827, resulting in her three youngest children being left in the care of James and Mary Whitfield. It has taken considerable time to complete this research and I am now comfortable placing Mary Jones as the common-law wife of George F. Wright, mother to his five children. 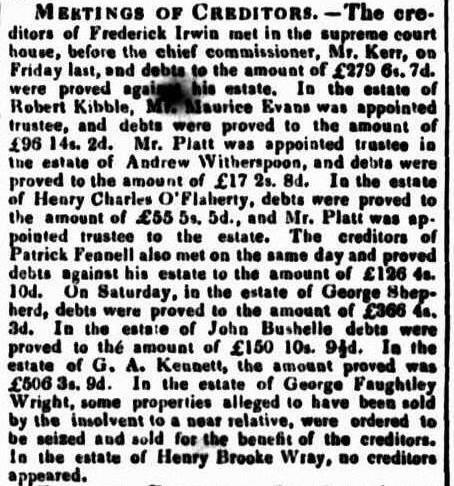 Some family researchers have suggested that George F. Wright remarried after his wife Mary’s death in 1827, some ancestry tree have even connected him to Esther Onions, however I am certain that Esther married George R Faughtley ‘Wright’ Jnr, George Wright’s son. I don’t believe George Wright legally ever married, and like his relationship with Mary Jones, George probably maintained a common law marital relationship with Mary Whitfield after her husband either died or shot through. I spied this interesting newspaper clipping on the same page as the death notice for George F Wright. It caused much interest and excitement, and even interrupted the telegraphic services across Australia. The was much scientific analysis available in ensuing editions. As much as I have searched for a marriage record for Mary Whitfield and George Wright and have found none, I also cannot be sure about the success of Mary’s marriage to Thomas Whitfield. It may well be that the marriage broke down and Mary actually did end up living with George Wright, and it would certainly make sense for them both. Mary would have bought up George Wright’s three youngest sons for some years and for her to be recorded on George Wright’s death record I have to give credence to this possibility. 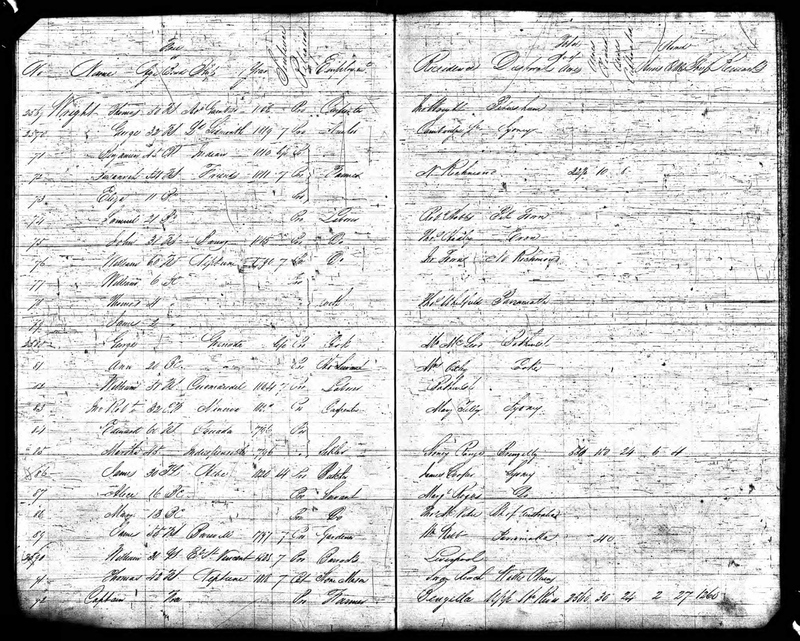 Thomas Whitfield is listed in this document as a convict aboard the Indefatigable and at the very bottom of the page George Wright convict aboard the Somersetshire, is listed. Thomas and George both appeared before the Old Bailey in London. It would seem that Thomas and George knew each other and perhaps this is the friendship connection? All this time I assumed it was Mary Mascall who married Thomas Whitfield who was the “friend” who then did George a favour in fostering his children. This document is listing the Marriage Banns for Thomas Whitfield and Mary Mitchell, now for the first time perhaps this document shows Mary’s maiden named properly spelt for the first time. It also lists the ships, Northampton and Indefatigable, that they arrived on. I searched for a death record for Mary Whitfield, without success, there is always the possibility that Mary may have remarried again after the death of Thomas Whitfield, thereby changing her surname again. I did find a death record for Thomas Whitfield for 1846 but I hesitate to collect it because it may well belong to another Thomas Whitfield. 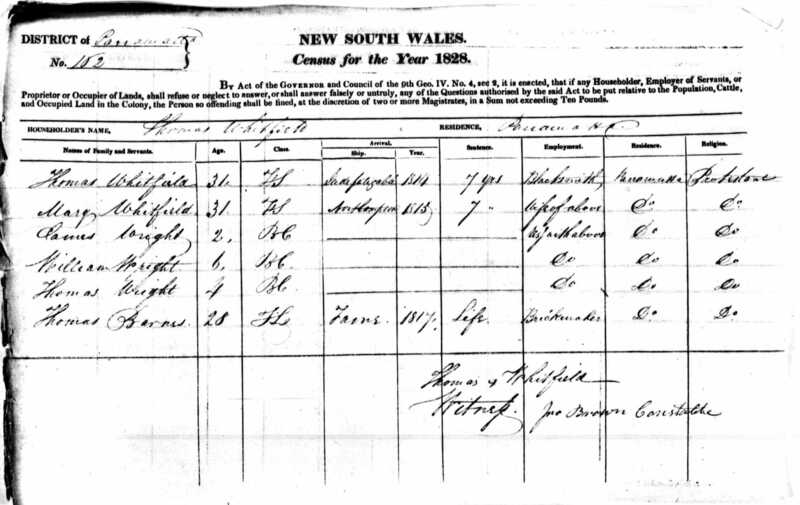 As a matter of complete coincidence, a convict named Thomas Whitfield is listed on the Somersetshire, listed with George Wright, who both arrived in Sydney in 1814, see previous record for George Wright’s arrival in 1814 on board the Somersetshire. George Wright I believe was a lovable rogue, I have enjoyed collecting record after record of his life of crime, misdemeanours, scrapes with the law, his creditors and his family. George moved just in front of the authorities and the law, however sometimes he got caught and then he served his punishment. His Ticket of Leave was a mess, it had been rubbed out so many times that it was virtually unreadable. He obviously needed good friends during his troubled times, and they must have looked after him and his children, as life dealt out unfairly a series of tragic events that would steer him into the headlights of the law. The death of his “wife” Mary Jones was one such tragedy which would have left George unable to support his children. The tragedy was that Mary’s death affected all the family, and the stint the two youngest children spent in an orphanage was a sad ordeal. Thomas and Mary Whitfield were obviously good friends to help out George and Mary’s three youngest children. The two eldest were survivors as well, both would have been servants at a young age knowing that there was no home to return to. It was tough growing up in Sydney in the early colony, and tougher still when life dealt out bad cards such as a tragic death, financial hardship and an existence living on the “breadline”. It unsurprising that George changed his name. I think it was survival instincts kicking in, and the best idea the wily George Wright could muster. It was also sad to see that in the end, he suffered a shocking illness from cancer and that his death was most certainly a painful one and dare I say, so unfair after all he had gone through in his life? It was a lucky day for George Wright when his daughter Mary Ann Wright married William Brown. 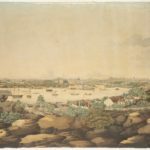 William Brown, a convict from the Asia in 1822, turned his life around, and in a “rags to riches” story, became a successful business man in the unforgiving and cutthroat world of the Market Street Wharves. I suspect that William Brown looked after George and some of his wayward sons during his lifetime, being a good son-in-law and indulgent husband to his beloved Mary A. Faughtley. The internet has been a boon to the family researcher and incredibly the Old Bailey of London criminal trials are all now online, at the press of a button. It was exciting for me to be able to confirm other Ancestry.com reseachers’ extracts on George Faughtley Wright and find his life of crime back in London. Like so many before and after him George’s life sentence was commuted to Transportation for Life to the Penal Colony of New South Wales. His reprieve, aged only nineteen gave him an opportunity for a new life and a new start in a foreign country on the other side of the world. I was also able to find Mary Jone’s trial from the Old Bailey as well. George was found guilty and sentenced to three months on a chain gang, which must have been a most dreadful period of his life. It is unimaginable how degrading and how low his life had stooped, and for a convict, it was the worst sentence that a convict could receive. It is legendary how badly the chain gangs were treated and how terrible the deprivation that was handed out to them, they were whipped and in many cases neglected, often in the harsh sunlight of a Sydney summer, and their wounds were left untreated. 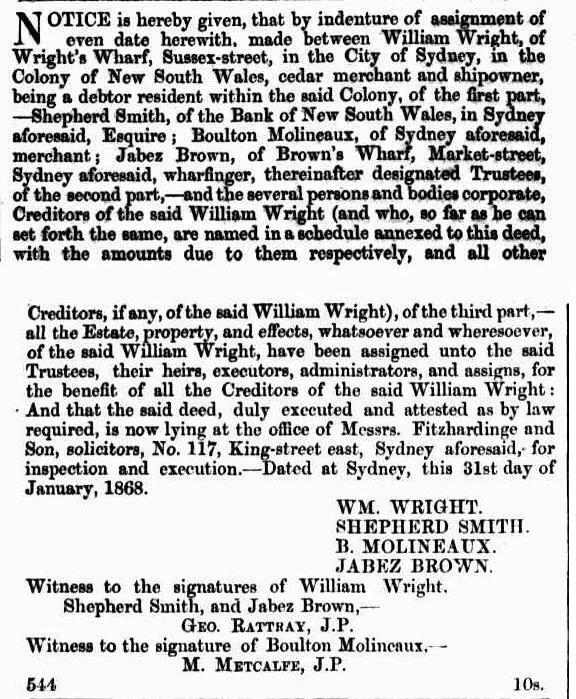 George Wright’s convict record could be described as a disgrace, in all his years in the Colony of New South Wales, he was never a truly reformed criminal, and he probably lived on the margins of financial distress, skirting all types of criminal activity. That he was involved down at the Market Street Whaves bears testament to the rough type of person involved in activities such as commission agents, importation licensing, stand-over tactics and I would suggest enormous competition for survival. George I think, lived on the fringes of all these activities and was probably a likable rogue. He was a good father to five children, and obviously kept in touch with his them, which was very commendable considering his circumstances. Sadly, George was probably no better off in Australia than he had been in England’s squalor and poverty. Somehow, he couldn’t bring himself to conquer the demons of his upbringing, and conform to the new Sydney culture that saw it become one of the most law-abiding cities in the world. How ironic this was, coming from a society mostly made up from transported criminals? 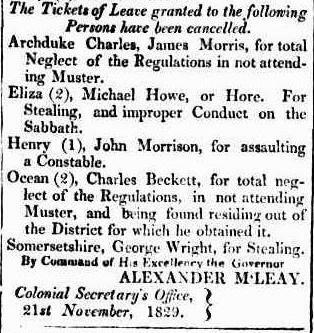 Transported in 1814 aboard the Somersetshire, and convicted for life, a term that could have been turned around in a few years with good behaviour, took George thirty-one years to achieve a conditional pardon. It would be many years before he could apply for an absolute pardon, and this record is one that I have not found, possibly it was never granted. George Wright and Mary Jones had five children. Their eldest daughter Mary A. Wright AKA Faughtley 1815-1888 married William Brown 1805-1864. They were the Great-great-great grandparents of my husband Geoff Rundle and their lives have been dealt with in another chapter called William Brown – A Proud Australian. 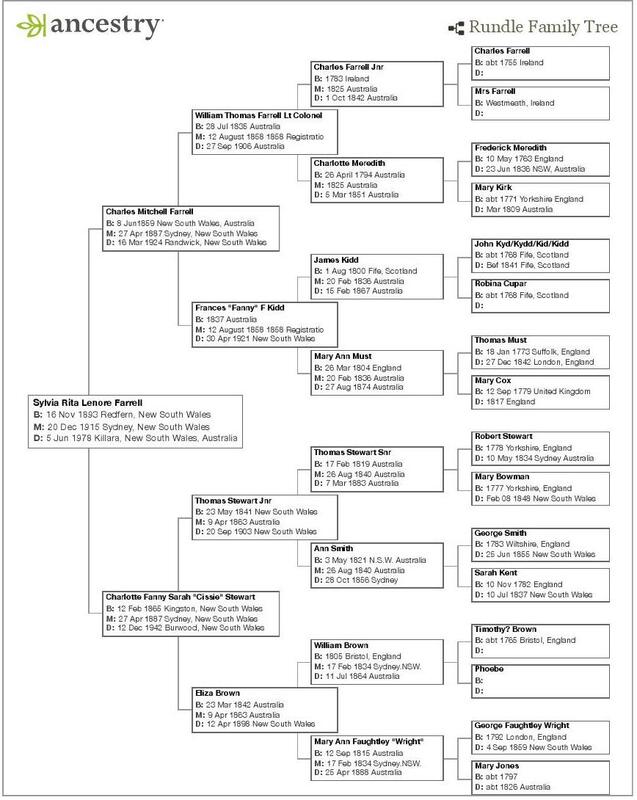 This Pedigree Chart is possibly the best way to show the relationship of the Wright and Brown family in our family tree. Geoff’s family, in all branches arrived early to the Colony of New South Wales. In fact, Frederick Meredith arrived on board the Scarborough, as steward to the captain, as part of the First Fleet. It was inevitable that sooner or later that one of Geoff’s ancestors married a convict. Indeed, take your pick, Mary Kirk, James Kidd, George Smith, William Brown, George F Wright and Mary Jones were all transported to the Colony of New South Wales. Geoff’s ancestors made a valuable contribution to Australia, either free or by servitude. Their bravery in coming half way across the world, in leaky boats to a new land which they were proud to call home, is so admirable, especially after wars, religious bigotry, famine, crime, family tragedy and crisis’ drove these migrations. George Faughtley Wright and Mary Jones’s eldest son George R Faughtley Wright (1817-1879) married Esther Onions (1815-1852) on 15 July 1835 and they had three sons, Robert Faughtley Wright 1837-1853, George W Faughtley Wright 1841-1906 and James Faughtley Wright 1843-1843. After Esther Onions death in 1852, George R Faughtley Wright married a second time to Sarah Ann Berrett and they had four children, Sarah Ann Wright (1862-), William James Wright (1863-1867), Frederick Thomas Wright (1865-1866) and Annie Victoria Wright (1867-1868). 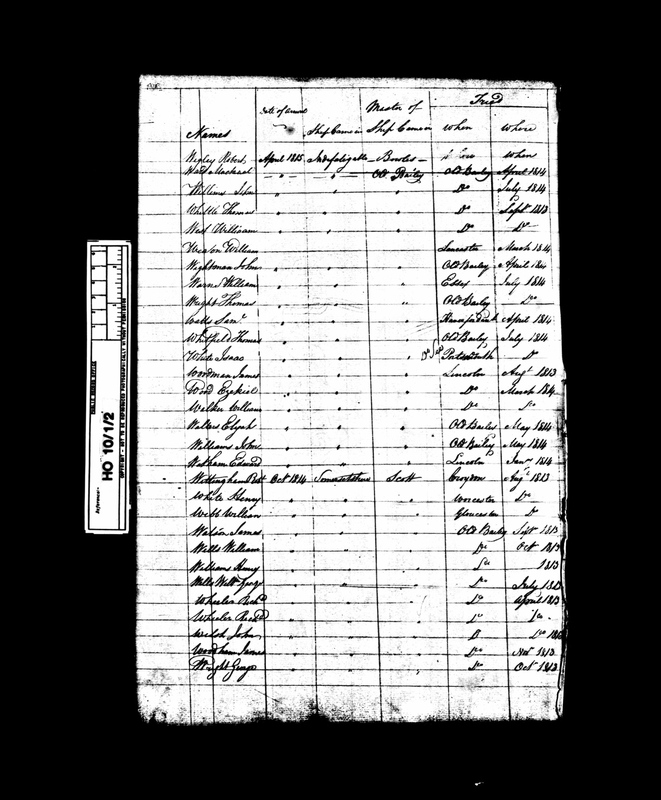 Earlier in this chapter I illustrated the 1822 NSW Census for George F Wright and Mary Jones, living with their three sons. In 1828 George R F Wright is working as a servant for James Clark. 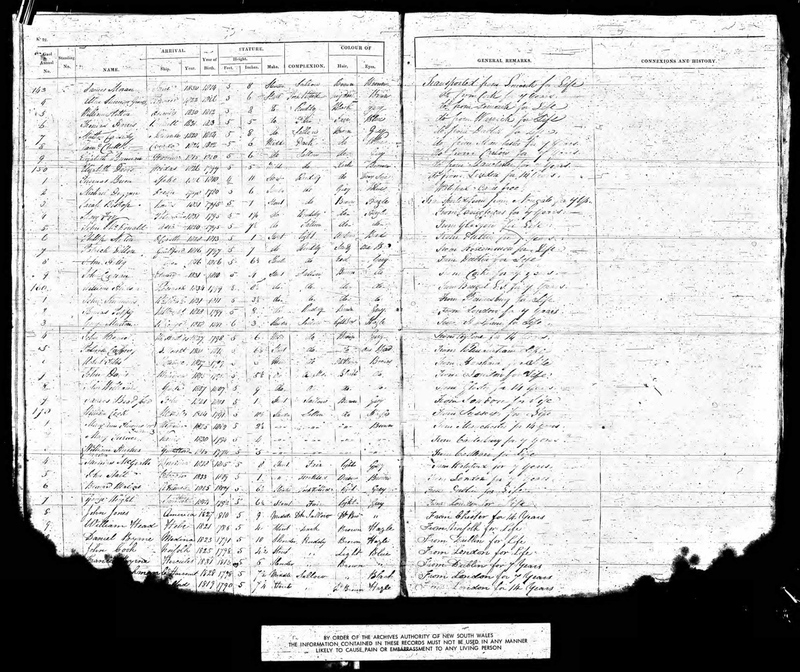 George Jnr’s name can be found on the same Census that his sister Mary and father George are also listed. George R F Wright Jnr worked down at the Market Street wharves with his father during his early life, and at one stage I believe father and son even had their own Wright’s Wharf for shipping consignments and lading of goods. However most of the newspaper clippings I can find for George show that he was in financial difficulty for most of his adult life. I had trouble working out father and son newspaper mentions of George F Wright. 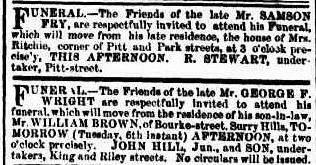 By 1841 George Jnr was working as a brazier in Market Street when he was forced to liquidate his estate. 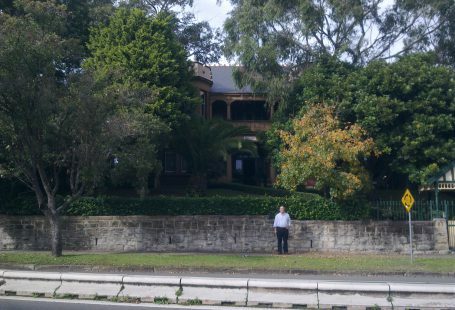 It was alleged in court that some properties in the estate had been sold by the insolvent George Faughtley Wright, to his relatives, instead of for the benefit of creditors. This lovely grave survives today in the grounds of Camperdown Cemetery in the centre of Sydney and it is a wonderfully unique tribute to George F. Wright (died 1879) that his two wives are buried with him here. 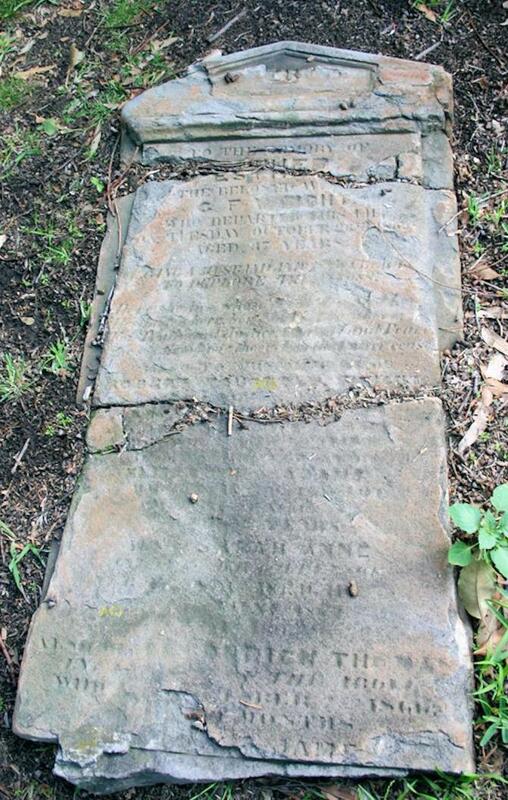 His first wife, Esther Onions (died 1852) and Sarah Ann Berrett are named on the grave together with four of George and Sarah Wright’s infant children, Sarah Ann Wright, Frederick Thomas Wright (died 1866), William James Wright (died 1867) and Annie Victoria (died 1868). The writing and dates are barely legible, but some words still stand out on the grave quite clearly. Today the Wright grave is a ledger, but clearly originally it would have been a standing grave here amongst the original Sydney grasses and tall shady trees at Camperdown Cemetery. William Faughtley Wright 1818-1872 was the second son of George F. Wright and Mary Jones. William Faughtley Wright married Frances Eleanor Davies at the Presbyterian Scots Church in 1847. 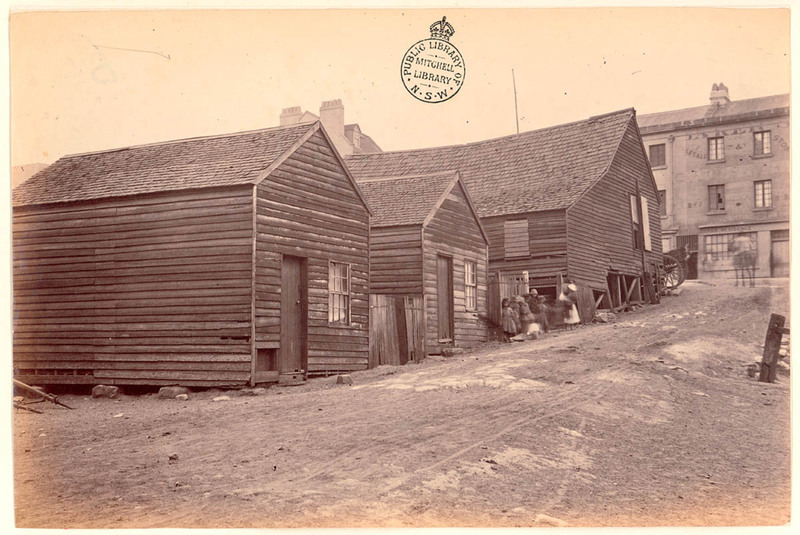 Wright’s Wharf, Next to Market Wharf, off Sussex Street, 1875, State Library of New South Wales albumen photoprint ; 12.6 x 19.2 cm. Thomas Faughtley Wright (1824-1885) was the third son of George Faughtley Wright and Mary Jones. 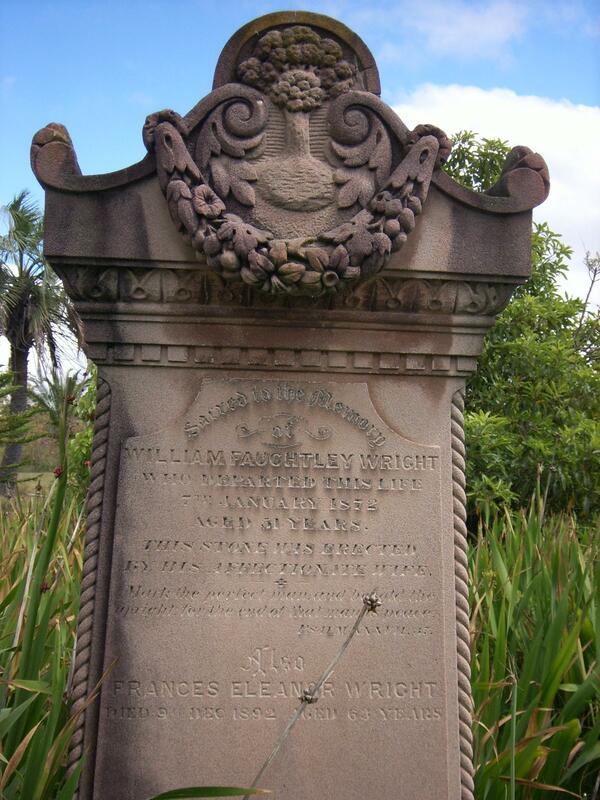 Thomas Faughtley Wright married Anne Roulston (1825-1867) on 26 August 1844 at Petersham in Sydney. They had nine children, Mary Ann Faughtey Wright (1845-1920), Sarah Jane Faughtley Wright (1847-1914), William Faughtley Wright (1849-1850), Thomas James Faughtley Wright (Rev. 1859-1902), Joseph Francis Wright (1853-1853), Phoebe Jane Faughtley Wright (1854-1934), William Joseph Wright (1856-1928), Esther Agnes Wright (1859-1919) and Emma Gertrude Wright (1861-1939). 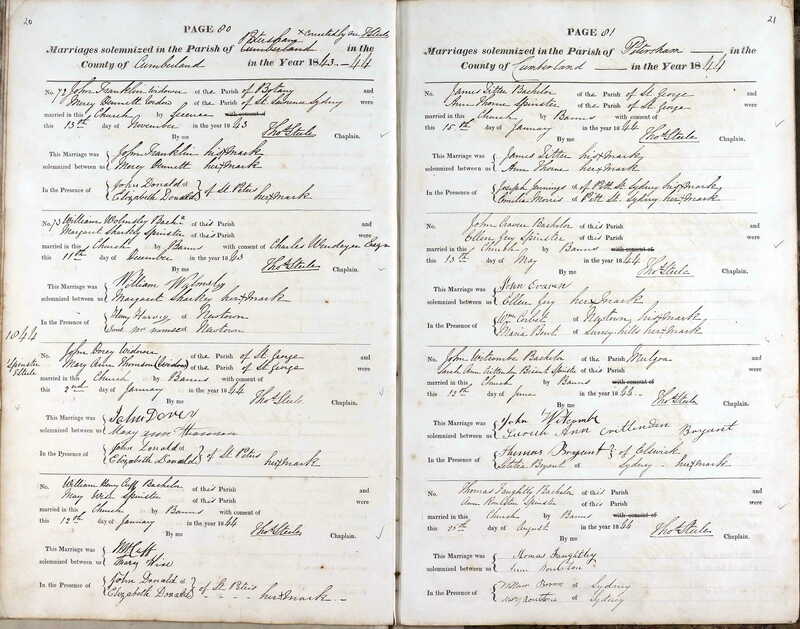 This wonderful Anglican marriage record is so early and interesting and keen readers will see that the witnesses were William Brown and Jane Roulston. William Brown was Thomas Faughtley’s brother-in-law who was married to Mary Ann Wright and Jane Roulsten was Ann’s sister. Thomas Wright was just fourteen years old when he was listed in this record, listed as born in the Colony of New South Wales in 1822. There is no listing of his crime, just a description of his main features. Five feet seven inches in height, slender build, Light complexion, brown hair and blue eyes. I accepted this record with some reservation, it may turn out not to be his. 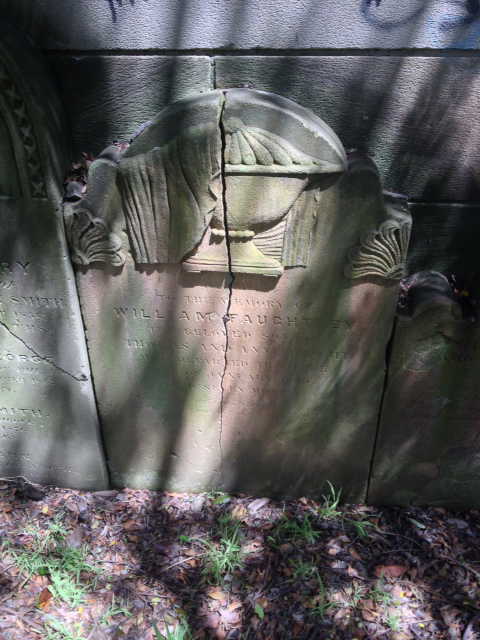 This lovely, but damaged headstone is for the son of Thomas Fautley Wright and his wife, William died 25 September 1850 and the inscription is very hard to read. The headstone is now attached to the back wall of Camperdown Cemetery and is one of a large group of surviving headstones removed when the cemetery was quartered in size. Unfortunately, the “experts” of the time decided to attach these historic headstones to the wall with large iron bolts and over time they have expanded and as a result the majority of the headstones have cracked and the bolts have rusted. 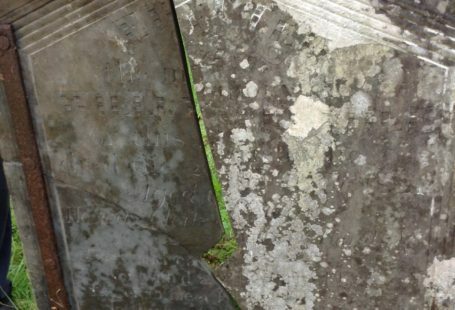 The weathering of the headstones has been magnified by the weather effect of the cracking and rusting. 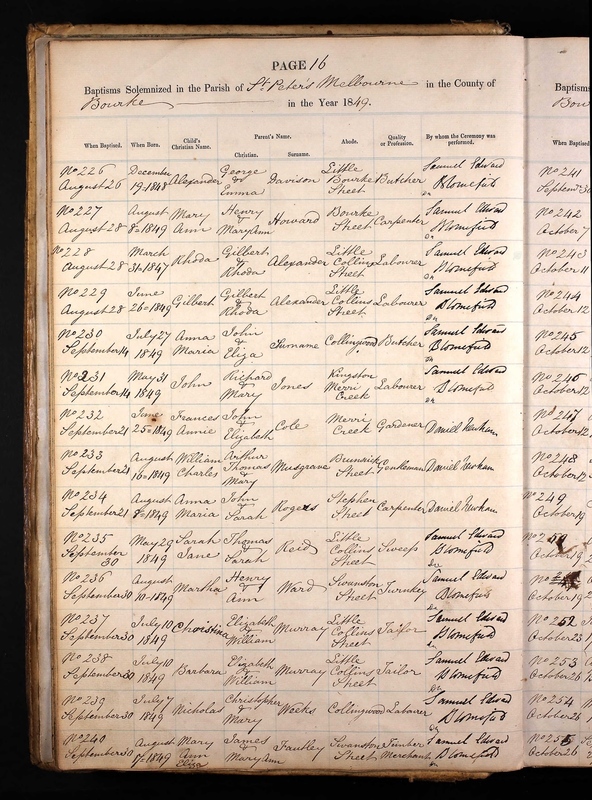 Burial Register for William Faughtley Wright, aged 7 months, son of St Stephen’s Church, Camperdown, father’s occupation listed as a writing clerk of O’Connell Town. 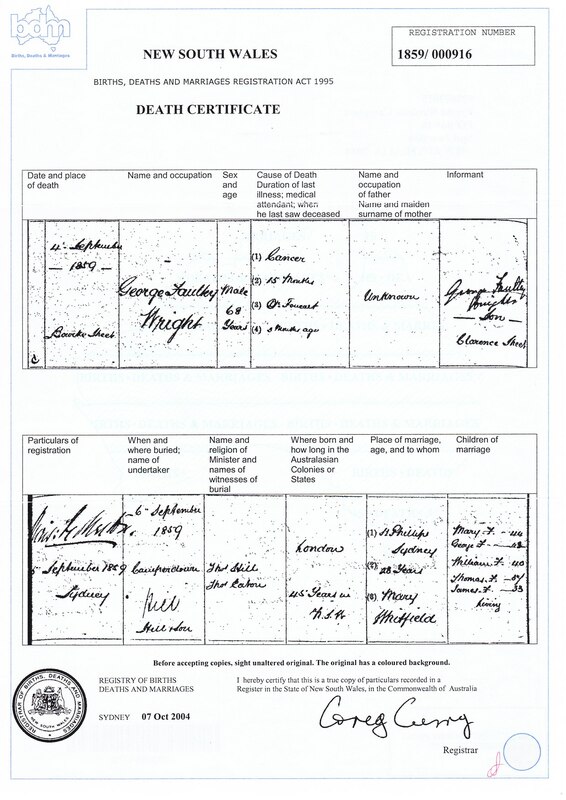 Shortly after I uploaded this chapter on the Wrights I had a wonderful connection with Gina Godden who is a descendant of Thomas and Ann Wright, she kindly shared some of her documents on the Wright family including this Burial Register from St Kilda Cemetery. James Faughtley Wright (1826-1889) was the youngest son of George F Wright and Mary Jones. James Faughtley Wright married Maryann Dawes (1826-1883) on 23 March 1847 and they had four children, William Faughtley Wright (1845-1914), James Faughtley Wright (1847-1926), Mary Ann Eliza Fautley Wright (1849-) and George Robert Faughtley Wright (1851-1883). 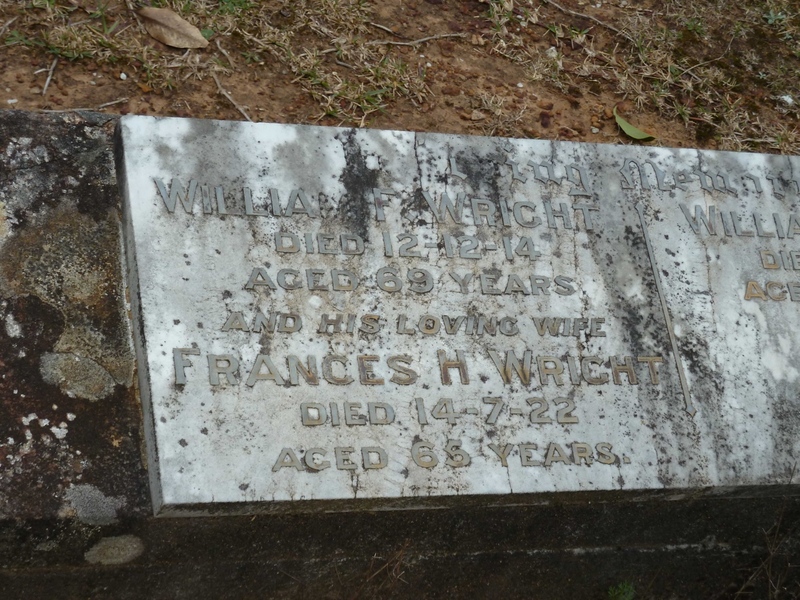 William F Wright died 12 December 1914 aged 69 years and his loving wife Frances H Wright died 14 July 1922 aged 65 years. This photograph is courtesy of Ancestry.com kojakone family tree. William F Wright was the eldest son of James Faughley Wright and Mary Ann Dawes. The work done on this chapter has been one of the most interesting areas of original research I have undertaken. 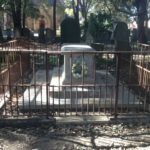 It involved trawling through hundreds of NSW Census records, reading scratchy writing and capturing the correct records for our family to prove that Mary Jones was indeed the common law wife of George Wright and the mother of his children. The answers I needed were simply just there to find in the early records of the Colony of New South Wales. Mary Jones was well recorded as the common-law wife of George Wright and I hope this documentary evidence will be embraced by other Wright family researchers. It is my hope that eventually the mess of ancestry family trees will slowly be corrected to reflect accurately the early Wright family history in the Colony of New South Wales. 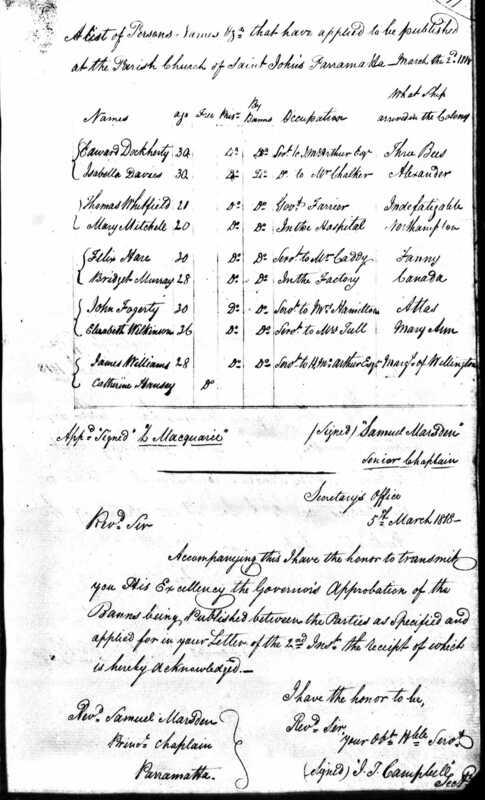 The information in this document was gathered with the assistance of ancestry.com records and their online family trees, online records from the Old Bailey and online shipping documents for convict transportations to Sydney. 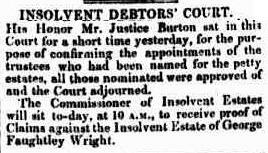 I also used Trove digitised newspapers where there is a lot of information on the Wright family ‘business’ enterprises. I have also corresponded with many family researchers in the compiling of this article, and have recently written a companion article called William Brown – A Proud Australian. I am happy to correspond with family researchers and collaborate on more family research. Hello there from Susan Henderson nee Wright. Finally one mystery is solved. Have been hitting my head against the wall over Whitfields & Tarlingtons for years. I’m descended from James Wright & Mary Ann Dawes. My father’s Wright line has quite a few William Wrights. They all had the Faughtley/Fautley/Fortley middle name even the females. Unknown how that came about. My grandfather’s name was Arthur Newton Faughtley Wright & my father was Arthur Thomas Wright. They lived in Newtown, Sydney. The mother of Arthur Newton Wright had to renounce her Jewish faith to marry her husband William. She was the daughter of George Louis Asher Davies whose brother Edward Davis was a bushranger hung in 1841. He was the leader of the Jewboy Gang.